Turkey's growing hostility to Israel may have been partly caused by its effective rejection by the European Union, the US defence secretary says. 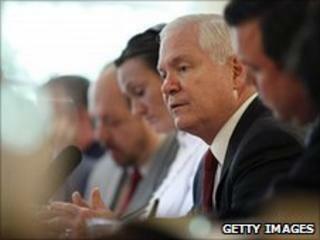 Robert Gates said Turkey may have been "pushed by some in Europe" away from the EU and into closer partnerships with states like Iran. Turkey has been put on the path to EU membership, but countries like France and Germany are openly opposed. Turkey and Israel's once-close alliance has come under severe strain. Their relations were already deteriorating before Israeli troops stormed a ship carrying aid to Gaza last month, killing nine Turks. Turkey's President, Abdullah Gul, said relations between the two countries would "never be the same", while Deputy Prime Minister Bulent Arinc accused Israel of "piracy" and "barbarism and oppression". Turkey has also strengthened ties with Iran, firmly opposing sanctions over its nuclear programme. "The deterioration in the relationship between Turkey and Israel over the past year-or-so is a matter of concern," Mr Gates said during a visit to London. "I think the two had a pretty constructive relationship and one that contributed to stability in the region, and I hope that, over time, that kind of constructive relationship can be re-established," he added. "I personally think that if there is anything to the notion that Turkey is, if you will, moving eastward, it is, in my view, in no small part because it was pushed, and pushed by some in Europe refusing to give Turkey the kind of organic link to the West that Turkey sought." "I think we have to think long and hard about why these developments in Turkey [occurred] and what we might be able to do to counter them." The issue of whether Turkey should join the EU strongly divides European governments. It started formal membership talks in 2005, but has only been allowed to open 12 of the 35 chapters that candidate countries must complete. Some, like Britain, firmly believe Turkey should be encouraged to modernise and westernise, and that welcoming a big Muslim country would strengthen Muslim moderates. The US has also supported this view. But other countries, like Germany and France, fear Turkey could destabilise the EU, not least with mass migration, and think it should be offered no more than a "privileged partnership". Has Israel lost key Muslim ally Turkey? Where next for under-pressure Israel?